December 1925. 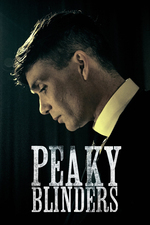 Tommy Shelby OBE (Cillian Murphy) has acquired unprecedented legitimacy. The former gangster is also a man alone, estranged from his family and focused only on business. But when he receives a mysterious letter on Christmas Eve, Tommy realises that the Shelbys are in danger of annihilation. I am happy that the series seems to be returning to a less convoluted direction. The narrative seems to make so much more sense. The death(s?) that occur will move the plot forward and connects to last series in a way that Grace's death did not. I was deeply disappointed in season 3 but am optimistic that this season will be better with richer character development and story arcs. The violence that Tommy commits in "The Noose" is horrifying and a reminder of what he is capable of. One element of Peaky Blinders that I have consistently respected is that any violence is never, to me, glorified. In series one when Moss says it looks like "he was killed by an animal," the way the Changretta is handled in series 3 or how maniacal Tommy looks with Antonio or the chef, the violence is revolting and not celebrated or gratuitous. Tommy comes across as a monster. Hunh, is this the only season on here? The thing about this series is when people are shot, you never know if they may actually be dead, because this series does not seem afraid to hurt or kill people. (See:Grace). It’s really compelling, but does mean a lot of bingeing.